First things first: Burgundy produces boh red and white wines. In fact, even though it is Burgundy's fine red wines that command the most respect and the highest prices, 71% of Burgundy's annual wine production is of white wine. Burgundy's essential red-wine grape is the Pinot Noir. White wines may be made from white grapes, or from red grapes pressed of their juice and separated from the red skins that would otherwise color the wine. 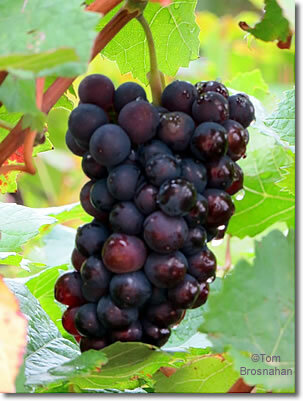 The prime red-wine grape of Burgundy. The prime white-wine grape of Burgundy. The Aligoté grape is used primarily for less expensive white wines. It is also the wine used in some Dijon mustards. Pinot Noir grapes at harvest time (October), Gevrey-Chambertin, Côte d'Or, Burgundy, France.